Our school librarian is on a mission to add many nonfiction graphic novels to our library. 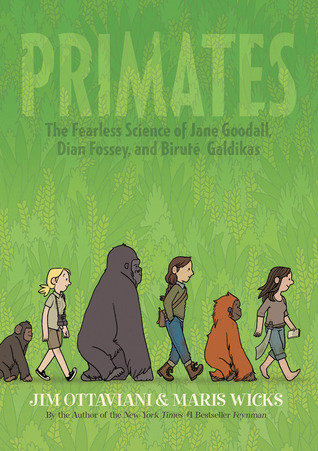 Primates by Jim Ottaviani and Maris Wicks, is an excellent addition that will span readers from grades 3 - 7. I love that readers of different ages will take different lessons from the book. In reading about Jane Goodall, Dian Fossey, and Birute Galdikas, younger readers might be inspired by these women who dreamed of living in the wild and studying animals. Slightly older readers might be heartened by the fact that none of them were experts when they started out, but rather, they were hard workers who wouldn't give up. An even older audience might read into the references to mentor Louis Leakey's romantic interest in the women and intuit that there is much more to Dian Fossey's life than is laid out in this children's book. The cover has major appeal; as it sat on my desk, several students gravitated to me and lined up to read it when I finished. They won't be disappointed and I hope they will be inspired to learn more about these complicated and accomplished scientists.